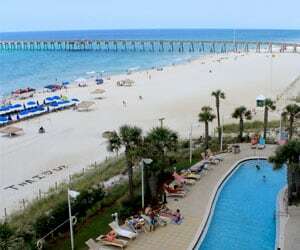 Panama City Beach offers 27 miles of beautiful white beaches, shopping and entertainment. Front Beach Road and Thomas Drive in Panama City Beach are quickly becoming top family vacation spots and have recently seen new community growth and revitalization, adding to the allure of the area. With the expansion of Pier Park shopping mall in 2014, Panama City Beach boasts one of the largest outdoor malls in the area. Complete with the recently expanded Miracle Strip Amusement Park, Pier Park can provide days of entertainment and shopping for the entire family. Located adjacent to Pier Park, the 70-acre Aaron Bessant Park hosts a variety of events throughout the year. The centerpiece of Aaron Bessant Park is a state-of-the-art amphitheater, which hosts world famous musicians and local community performances, all just steps from the beach! Russell-Felds Pier, also known as the City Pier, is located across the street from Aaron Bessant Park, sits 1500 feet out into the Gulf of Mexico and is open all year. There is a vast expanse of attractions and entertainment, from family-friendly mazes and Florida sport fishing to exciting nightlife and relaxing spa getaways in Panama City Beach. Many popular local restaurants line Front Beach Road, including some of The Nathan Abbott Team’s favorites likeFirefly, Dusty’s Oyster Bar, Fatty’s Sandwiches and Bud and Alley’s. Panama City Beach hosts several major events every year, including the Pepsi Gulf Coast Jam, Pirates of the High Seas Fest, Seabreeze Jazz Festival and more. At the East end of Thomas Drive, St. Andrew Bay and St. Andrew’s State Park offers a variety of nature adventures and is rich in American history. Previously home to Native Americans, Pirates and US Military operations, the St. Andrew Bay area now provides family centered fun and recreation. Splash Resort Condominiums offers Gulf Front 1, 2 and 3-bedroom condominiums. Amenities at Splash include private Gulf front balconies, fitness center, Gulf front arcade, lazy river, pool side bar and grill, two heated pools, hot tubs, toddler splash pad, interactive water park, movie theater, beach services, wireless internet, covered parking and an on-site convenience store. Palazzo offers 1, 2 and 3-bedroom luxury condominiums. Each unit has a fully equipped kitchen with granite countertops, 9-foot ceilings, washer/dryer and private balconies with gulf views. Amanenities at Palazzo include an elevated tropical Gulf front pool and spa, fitness facility, meeting space and covered parking. The Nathan Abbott Team was one of the preconstruction listing agents for Palazzo and has been involved the majority of units sold since the completion of the building in 2008! Tidewater offers 1, 2 and 3-bedroom condominium units and has 636 feet of private beach. Amenities at Tidewater Beach Resort include to huge lagoon pools, an indoor heated pool, fitness center with Roman spa, conference center and movie/media center. Each condo at Sterling Breeze features a private Gulf front balcony with electric grills, flat screen tv, full-size kitchen, washer and dryer. Amenities at Sterling Breeze include a poolside wine bar and internet cafe, infinity edge Gulf front pool and spa, fitness center, free DVD rentals and covered parking. Each unit at Calypso features a private Gulf front balcony, fully equipped kitchen and washer/dryer. 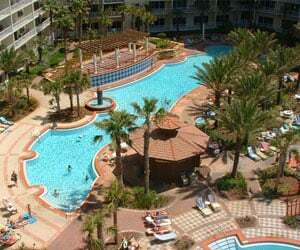 Calypso Resort and Towers amenities include two large outdoor pools, beachfront Tiki-Bar and a fitness facility. Aqua offers a variety of 1, 2 and 3-bedroom condominium units featuring granite countertops, full-length windows, and elliptical terraces. Amenities at Aqua Resort include a poolside cafe, whirlpool spa, Gulf front heated pool, fountains and water gardens, complimentary beach service, cascading water features and a fitness center. Sunrise Beach offers 1, 2 or 3-bedroom condominiums. Each unit features a Gulf front master bedroom, large private balcony, full kitchen, marble bath, and washer/dryer. Amenities at Sunrise Beach include two swimming pools, two hot tubs, kid’s splash park, game room, meeting room, fitness center, barbecue grills and complimentary beach service. 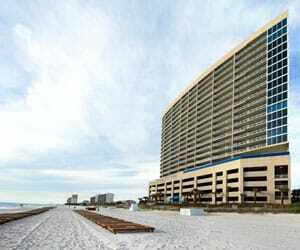 Grand Panama features Gulf front and Gulf view 1, 2, 3 and 4-bedroom condominiums and penthouse units. Amenities at Grand Panama Beach Resort include a leisure pool, two relaxing spa pools, fitness center, meeting rooms and the Village Shopping Center with restaurants. Majestic Beach Towers offers studio, 1, 2 and 3-bedroom units with optional bunks and deluxe features. Units feature private balconies and full kitchens. Amenities at Majestic Beach Towers Resort include 5 swimming pools (2 outdoor pools, 1 outdoor kiddie pool, 2 heated indoor pools), movie theater, tennis courts, fitness center, on-site general store, on-site Starbucks, and H2O Bar and Grill. Shores of Panama is a Mediterranean style beach resort offering 1, 2 and 3-bedroom units. Shores of Panama luxury resort amenities include a full spa, kids club, Gulf front pool and hot tub, heated indoor pool and hot tub, covered on-site parking, health center with fitness equipment, steam room, 2 tiki bars serving food and cocktails, beach activities and rental services and high speed internet access. Boardwalk Beach Resort offers 1, 2 and 3-bedroom condominiums featuring granite countertops, washer and dryer, full kitchens, table service, ceiling fans and private balconies offering unparalleled views of the Emerald Coast. Amenities at Boardwalk include private beach access, a zero entry heated pool, two hot tubs, kid’s interactive splash zone, fitness center, steam room, sauna, activity center, youth activities club and covered parking. Gulf Crest offers spacious 2 and 3-bedroom units that are equipped with full kitchens, washer/dryers, free high speed Internet and over-sized private balconies to enjoy spectacular Gulf views. Amenities of this gated resort include two beachside pools (one heated seasonally), two hot tubs, kiddie pool, free poolside wireless Internet, Tiki hut, fitness center, outside picnic areas with gas grills, covered parking and on-site security. En Soleil is a low-density 88 unit resort with Gulf front 2 and 3-bedroom units and penthouses. En Soleil features 450 feet of beach frontage, multiple swimming pools, two hot tubs, two water fall features, fitness center, covered parking and on-site security. Sterling Beach Resort is a low-density complex with only 92 units on 5 acres offering 2, 3 and 4-bedroom condominium units. Each unit features a private balcony, full kitchen and washer and dryer. Amenities at Sterling Beach include over 300 feet of beach frontage, heated swimming pool, whirlpool, grill area, children’s seasonal activities, fitness center, private 48 seat theater and complimentary DVD rentals. Seychelles Beach Resort offers 1 and 2-bedroom, 2-bath condominiums. All units feature ceramic tile in the foyer, hall, kitchen and bathrooms, two full baths with cultured marble vanity tops, washer/dryer and spacious balconies. Seychelles is located within walking distance of St. Andrews State Park and only moments from the Marina. Amenities at Seychelles include multiple pools, hot tub, sun deck, beach service, fitness center, meeting rooms, and covered parking. 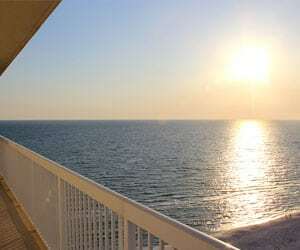 Treasure Island offers 2 and 3-bedroom Gulf front condominium units with private balconies. Amenities at Treasure Island include a heated swimming pool, dune walkover, fitness center, owner’s lounge, kiddy pool, gazebo and a covered parking garage. Pier Park is a popular entertainment venue in Panama City Beach. Pier Park features over 124 stores and restaurants and an IMAX theater. St. Andrews State Park features over 1.5 miles of beaches on the Gulf of Mexico and Grand Lagoon. Highlights of St. Andres State Park include swimming, snorkeling, scuba diving, kayaking, canoeing, two fishing piers, a jetty, a boat ramp, two nature trails, picnic pavilions, campsites, a concession store and Shell Island boat tours. 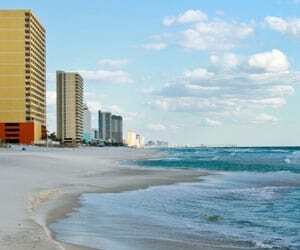 If you want to invest in a property in Panama City Beach, the Nathan Abbott Team is here to guide the way. View available properties in Panama City Beach or contact our Buyer Specialists at 850-812-3261 to schedule a consultation.